Ooh, I love this......the papers are gorgeous & I love the distressed edged! Have a lovely weekend! 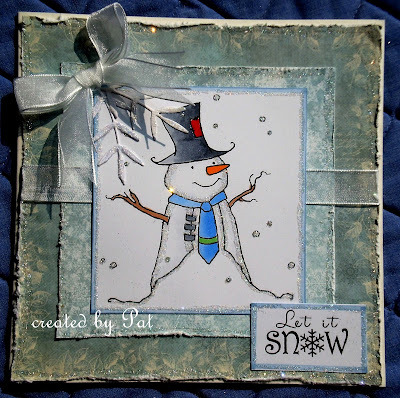 A lovely card - such a cute snowman image. Your icy look papers showcase this cute snowman to perfection. Even the ribbon and the bow have an icy feel to them. Fantastic card, Pat..!!! Beautiful card Pat. Love the snowman. I love this card a lot!!!! I do love snowmen and he is Mr.Snow himself. This design is fantastic - I hope you don't mind if one day I use it!!!! This is great, Pat! A cute image, gorgeous papers, and I love the glitter edges! Awww what a very cute snowman… he has such character! and love those rich papers! the distressed edges look really pretty with the sparkles! long time since I've sparkled my edges… must do it very soon!